Original Sin, or the belief that we are laden with wickedness due to Adam and Eve’s defiance of God in the Garden of Eden, is a pillar of most world religions. 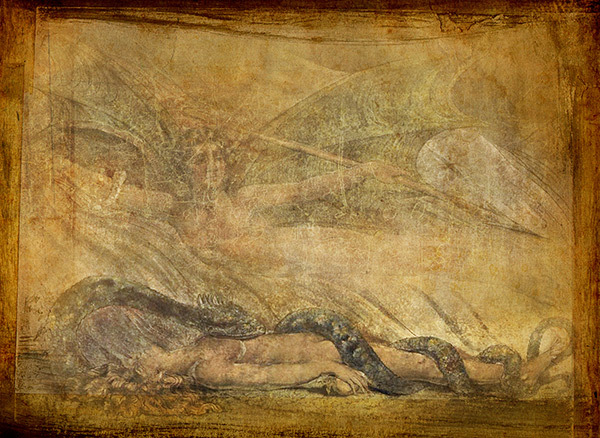 Infamously, the ‘fall of man’ (as it is often dubbed) came about when the first lady, and her man, succumbed to the temptation of the serpent and ate from the apple of forbidden knowledge. With one bite, the notion of original sin became the hot iron with which religious institutions (most notably the Catholic Church) have shamefully branded their faithful for over 2,000 years. However, what if original sin has been misunderstood? What if it was not a description of an event, but a memory of an individual, a god whose name was Sin: the first god, the giver of oracles, ‘the greatest of the gods and the goddesses’, the last of the Pagan deities to challenge the full and unqualified adoption of Christianity? Somewhere down the line the word ‘sin’ appears to have been misinterpreted, and therein lies the problem with the concept of original sin; the definition of the core word has become distorted. In Old English sin, or syn, means to miss the mark, quite literally, as in missing the ‘gold’ at the centre of a target in archery. To not hit the centre of the target is considered a miss, and so the notion of missing the mark, being in error, less than perfect, morphed into the popular definition of the word sin, which was used in the Old Testament to refer to behaviour that was not central to God and/or Jesus’s teachings. 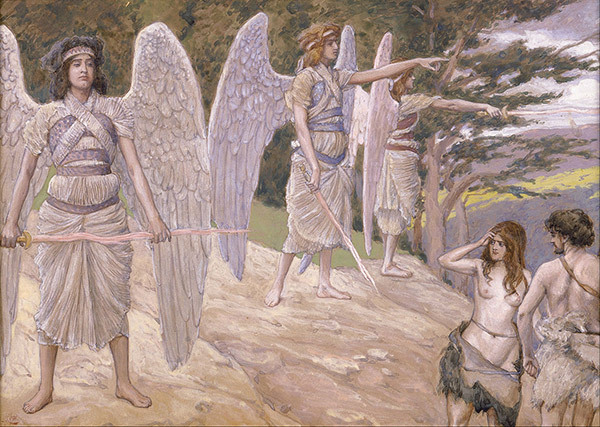 The Hebrew meaning of sin is similar and, in fact, there are six nouns and three verbs to describe the concept, including: Chata’ah, an innocent mistake; avon, the distortion of God’s will for personal gain; and pesha, a term used nearly a hundred times in the Old Testament and which translates as a transgression, or rebellion – an intentional breaking of the law (Torah). So, apparently the meaning of the word sin became misconstrued, and perhaps due to something as innocent as a poetic turn of phrase. Nevertheless, the word soon developed into a universally accepted definition of moral waywardness. But what about the concept of original sin? Where did it originate? There are many variations on the theme of original sin – sometimes called ancestral sin – but what each has in common is the belief that the loss of humankind’s immortality was the result of Adam and Eve’s disobedience in the Garden of Eden. That said, there is no concept of original sin in Islam. Rather, it appears to be a Christian invention, for the earliest mention of it comes in the second century, when the heresy-hater, the Bishop of Lugdunum in Gaul (now Lyon, France), Saint Irenaeus (130-202 AD), launched an attack against Gnosticism. Irenaeus claimed that Adam’s sin originated with (and was perpetuated by) ‘hurtful desire’, which affected mankind in profound and adverse ways. By all accounts this is what got the Adam-bashing party started. Irenaeus was from Smyrna (Asia Minor, modern-day İzmir, Turkey), a short distance from the coastal town of Erythrae. It was here that the Erythraean Sibyl presided over the Sibylline books, a collection of Oracle utterances written by a sibyl (on Mount Ida in the north of Asia Minor), which famously predicted the downfall of Troy. The books eventually fell into the hands of the last king of Rome, via the Sibyl at Cumae (in the province of Naples, Italy), who had received them from the sibyls at Erythrae. But that is a story for another time. The point is that the region is utterly rife with legends that Irenaeus would have been aware of, and which may have inspired elements of his campaign against Gnosticism. 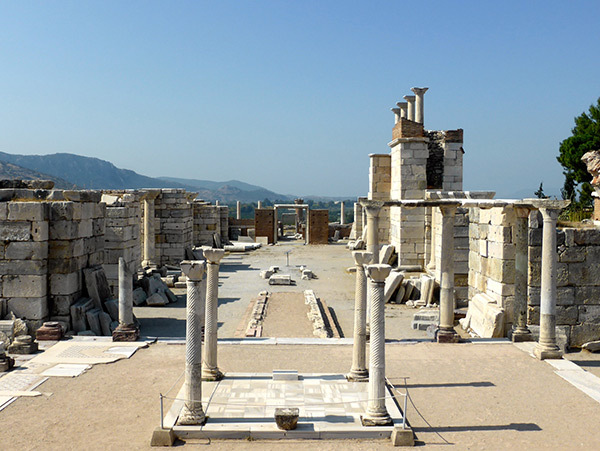 Not far to the south of Smyrna lies Ephesus, the famed settlement to which the Apostle John fled after the Assumption of Mary and before he was banished to the Greek island of Patmos where, according to tradition, he wrote the Book of Revelation; many of the Churches of Revelation are located near Ephesus. John is said to have died at Ephesus sometime after AD 98 and his tomb remains a site of pilgrimage. John is said to have taught young Saint Polycarp and anointed him Bishop of Smyrna. Polycarp, in turn, taught Irenaeus, who, like his teacher, became Bishop of Smyrna. 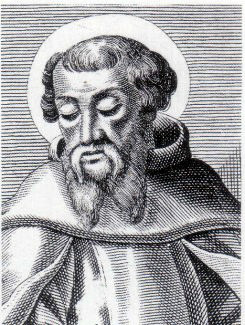 Irenaeus’s most famous work was entitled Against Heresies (circa AD 180) and the ambitious text remained the authoritative work on Gnosticism until the Library of Nag Hammadi was discovered in 1945. Irenaeus’s aggressive and damning work audaciously proclaimed that original sin was hereditary. The real question, however, is: why did Irenaeus fear the Gnostics? Might it have had something to do with the god Sin? The Eastern Orthodox Church followed Irenaeus’s lead, about one hundred years later, with its own version of original sin and proclaimed that it originated with the Devil, who had ‘been sinning from the beginning’ (1 John 3:8). The blame game deepens, but at least poor Adam is absolved in favour of the devil. The Jehovah’s Witnesses also echoed Irenaeus’s invention and taught that every man and woman were born sinners. Similarly, the Latter Day Saint movement blamed Adam for humankind’s fallen spiritual condition and the fact that we must all die someday. Not to be outdone, the Mormons distorted the story, as good spin-doctors do, adding that the transgression of the scapegoat, Adam, was an important and even necessary transgression. Martin Luther, John Calvin and other Protestant reformers believed that original sin persisted, even after baptism. And yet, for the most part, Judaism, like Islam, did not teach the doctrine of original sin, although the Koran does state that, although there was a transgression, it was forgiven by God. Still, the impact of the Adam blame game remains an unsettling element of modern religions and one that seems to have become embedded in our collective psyche. And a river went out of Eden to water the garden; and from thence it was parted, and became into four heads. The name of the first is Pison: that is it which compasseth the whole land of Havilah, where there is gold; and the gold of that land is good: there is bdellium and the onyx stone. And the name of the second river is Gihon: the same is it that compasseth the whole land of Ethiopia. And the name of the third river is Hiddekel: that is it which goeth toward the east of Assyria. And the fourth river is Euphrates (Genesis 2:10-14 King James Bible). 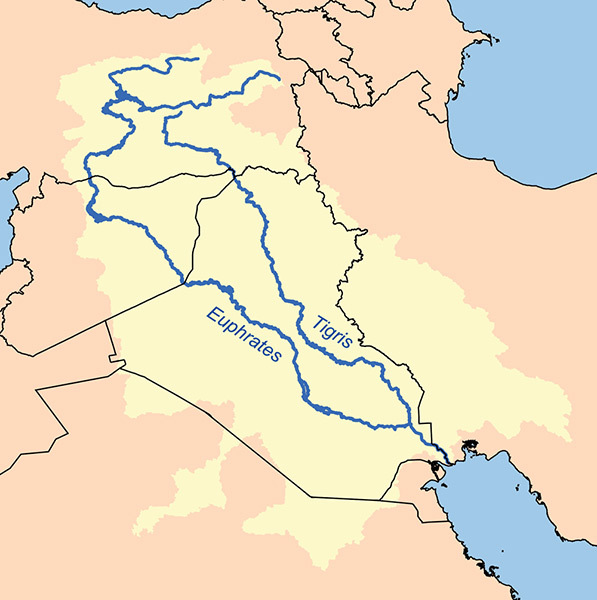 And so the four rivers of Eden appear to be the Pison, Gihon, Euphrates and Hiddekel (believed to be the Tigris). The debate over their source and the historical validity of Eden has been disputed ever since the story first emerged, with well-argued theories such as that of the historian, David Rohl, who argues that Eden is located near the Iranian city of Tabriz. 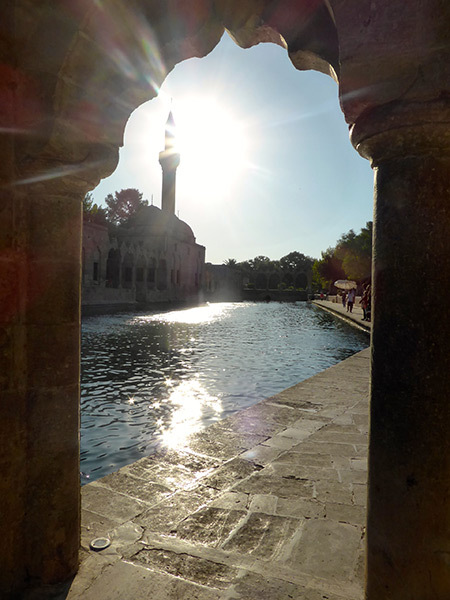 A further, recent theory is that Eden is located in Eastern Turkey, near the source of the Euphrates and Tigris. Clay plaster, harmoniously blended clay taken from the Edin canal, has been chosen by Lord Ningirsu with his holy heart, and was painted by Gudea with the splendours of heaven, as if kohl were being poured all over it. Broadly, this school of thought suggests that the account of Eden in Genesis is a memory of the pre-Sumerian culture that existed on the fertile plain of the Arabian Peninsula. It also suggests that Adam’s rib, which is referenced in the bible, is a mistranslation of the Sumerian word for rib, Nin-ti, meaning to ‘bring life’. Not surprisingly, Friedrich Delitzsch (1850–1922), a German Assyriologist, was the first among numerous scholars to suggest that the Jewish and Christian term Eden traced back to this term, which has also been connected with the later Babylonian term ‘Edinu’. The fact that the topography of the region is dramatically different today than when the story originates only complicates matters, for the terrain has changed to such an extent that the clues in Genesis could be nothing more than a red herring in today’s regenerated landscape. The point is that Eden, if it did exist, is likely to have been in Mesopotamia and this brings us to the god Sin, who presided there. Curiously, it has been argued that ‘Allah’ is not the Arabic word for ‘God’; that is, it does not derive from the same root as the Hebrew words El and Elohim, but rather it refers to a moon-god, and Mesopotamia is the home of the moon-god Sin. Proponents of this controversial theory cite Islam’s use of a lunar calendar and its association with crescent-moon imagery; Sin, a lunar god, is also associated with the number 30, the crescent moon and the object of Pagan worship, the bull. The god Sin was the Sumerian ‘Father of the Gods’ and ‘Lord of Wisdom’. Sin was also known as Nanna, the Mesopotamian moon-god, a Sumerian deity who was the son of the gods, Enlil and Ninlil. The Semitic moon-god, Su’en/Sin, was a separate deity, but merged with Nanna from the Akkadian Empire (circa 2334 BCE – circa 2154 BCE) onwards. Not surprisingly, the original meaning of Nanna has been lost. However, what we do know is that the lunar god’s primary seats of worship were in Ur in the south and in Harran in the north of Mesopotamia. Images dating from circa 2500 BCE depict the god Sin as an old man, often riding on a winged bull. His father, Enil, was known as the Bull of Heaven and thus the bull became one of Sin’s symbols. Many images also feature Sin with a flowing beard of lapis lazuli (a deep-blue stone, revered in antiquity and which appears to have been mistaken in the Old Testament as sapphire). But these were not Sin’s only symbols; he is also associated with the crescent and the tripod. Not surprisingly, each is a Pagan figure. Sin’s primary sanctuary was the House of Great Light at Ur and it was here that the role of En Priestess, a powerful title bestowed on a man or woman, which entailed much political power, appears to have first developed. However, Sin’s northern sanctuary was at Harran, an ancient city whose name translates as House of Joys. Although the cult of the moon-god spread far and wide, it was in Harran that the last vestiges of his cult flourished. Although these two cult centres were the most special, there were others, such as the temple of Sin at Khafajah (ancient Tutub), an archaeological site in the Diyala Province of Iraq, approximately seven miles (eleven kilometres) east of Baghdad. Here, Sin’s temple was aligned west of north, as if to bind Harran in the north and Ur in the south in a harmonious union. Most moon-gods were male, especially the original ones, like Sin. Thus, in order to establish a balance many cultures introduced female sun-goddesses. Examples of other male moon-gods include Mani, of the Germanic tribes, and the Japanese god, Tsukuyomi. Only later did lunar gods become female, such as Phoebe, Artemis, Selene and Hecate, and, even then, this was largely a Mediterranean tradition. Ironically, perhaps, it is the sun-goddesses that are remembered most. The masculine lunar gods, such as Sin, were largely airbrushed from history or, at the very least, demonised as nothing less than the gods of dark forces. 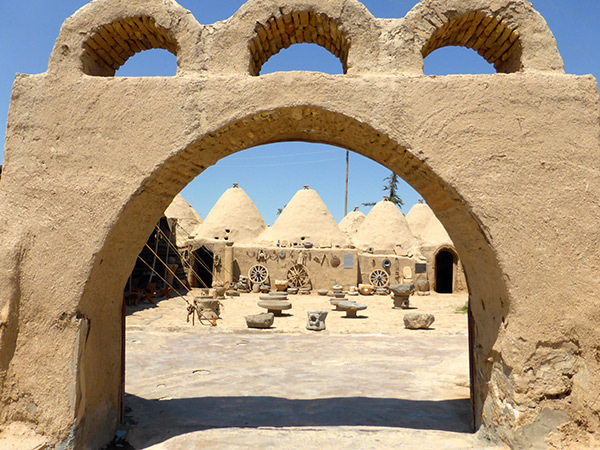 Few cities are as ancient, and storied, as Harran. Set in south-west Turkey, a short distance from the Syrian border, Harran was an important trade centre as far back as the third millennium BCE. 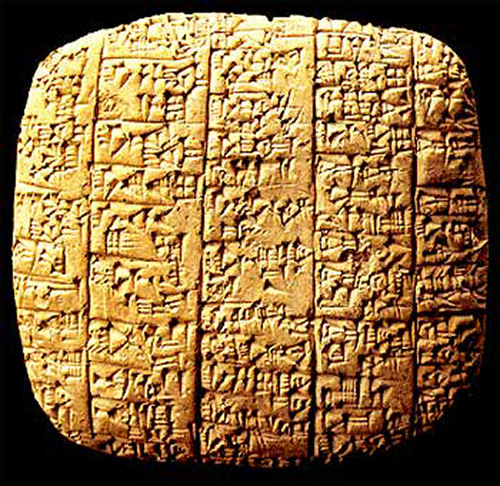 The Ebla tablets, discovered in Ebla, Syria, date from circa 2500 to 2250 BCE and contain the first reference to the ancient city: an account of a ruler of Harran who married an Eblaite princess named Zugalum, who became ‘Queen of Harran’. From there [Harran] two different royal highways lead to Persia: the one on the left through Adiabene and over the Tigris; the one on the right through Assyria and across the Euphrates. Not only did Harran have easy access to both the Assyrian and Babylonian roads, but also to the road north to the Euphrates which provided easy access to Malatiyah and Asia Minor. Harran, Canneh, Eden, Ashur, and Chilmad traded with you. They traded with you in choice garments, in clothes of blue and embroidered work, and in carpets of coloured stuff, bound with cord and made secure. Behold, you have heard what the Kings of Assyria have done to all lands, destroying them utterly. And shall you be delivered? Have the gods of the nations delivered them, the nations which my fathers destroyed, Gozan, Haran, Rezeph, and the people of Eden who were in Telassar? Harran remained an important site for a long time, which included the Assyrian, Hittite, Middle and Neo-Assyrian, Neo-Babylonian, Persian, Seleucid, Roman, Islamic, Mandaean and Crusader periods. To say it was resilient would be an understatement. 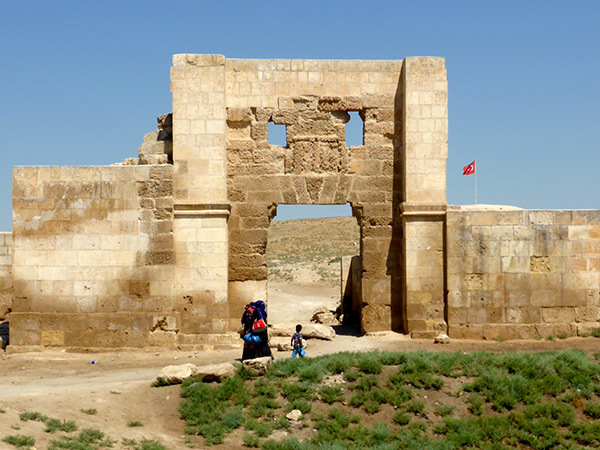 Legend states that Harran was one of the cities built by Nimrod, King of Shinar, son of Cush, and great-grandson of Noah. And, of course, Harran is strongly associated with Abraham, who settled here with his wife Sari and nephew Lot en route to Canaan from Ur of the Chaldees in the south. Abraham is said to have lived in Harran until he was 75, at which time he was instructed to go to Canaan. Later, Jacob fled from Esau to Harran, the home of Rebekah’s brother, Laban. Here Jacob acquired two wives and raised many children. Harran is steeped in history, clearly, but the extent of its significance may never be known due to the suppression of a relief, carved on a black stone, that was discovered in the ruins of Abraham’s living quarters over thirty years ago. Sadly, the relief is now concealed in the basement of the Museum of Anatolian History, Ankara. Evidently, what it exposes is too controversial and too explosive to be revealed, at least according to a Mesopotamian history expert from Harran, who informed me that he has seen the relief, thanks to his former instructor, who now works at the museum. 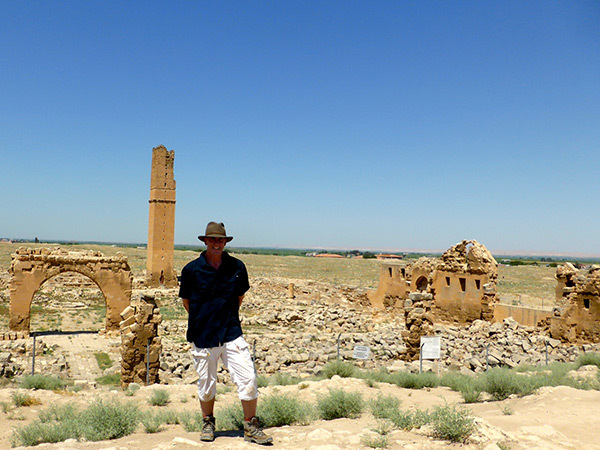 What remains in view are the brick and mortar traces of Harran’s ancient heritage. 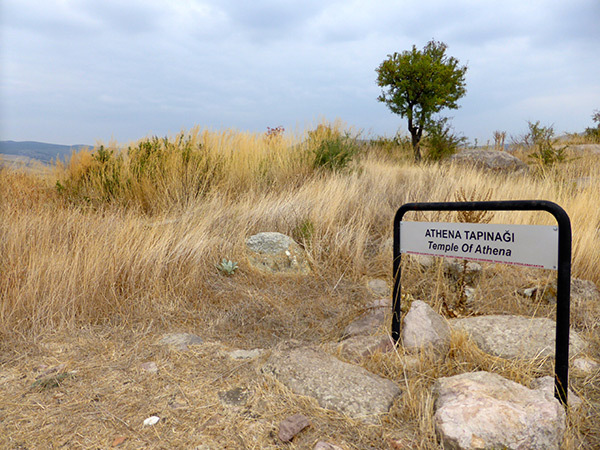 Take, for instance, the atmospheric ruins of the ancient university, the first in Turkey. Then there is the haunting beauty of the ancient city walls (two and a half miles (four kilometres) in total), which surround the ancient tell (hill or fortress). Of the six gates, only the Aleppo Gate remains. In the beginning of my everlasting reign they sent me a dream. Marduk, the great lord, and Sin, the luminary of heaven and the netherworld, stood together. Marduk spoke with me: ‘Nabonidus, king of Babylon, carry bricks on your riding horse, rebuild Ehulhul and cause Sin, the great lord, to establish his residence in its midst.’ I mixed its mortar with beer, wine, oil and honey and anointed its excavation ramps with it. More than the kings – my fathers – had done, I strengthened its building and perfected its work. That temple from its foundation to its parapet I built anew and I completed its work. Beams of lofty cedar trees, a product of Lebanon, I set above it. Doors of cedar wood, whose scent is pleasing, I affixed at its gates. With gold and silver glaze I coated its wall and made it shine like the sun. I set up in its chapel a ‘wild bull’ of shining silver alloy, fiercely attacking my foes. At the Gate of Sunrise I set up two ‘long-haired heroes’ coated with silver, destroyers of enemies, one to the left, one to the right. I led Sin, Ningal, Nusku and Sadarnunna – my lords – in procession from Babylon, my royal city, and in joy and gladness I caused them to dwell in its midst, a dwelling of enjoyment. I performed in their presence a pure sacrifice of glorification, presented my gifts and filled Ehulhul with the finest products, and I made the city of Harran, in its totality, as brilliant as moonlight. O Sin, king of the gods of heaven and the netherworld, without whom no city or country can be founded, nor be restored, when you enter Ehulhul, the dwelling of your plenitude, may good recommendations for that city and that temple be set on your lips. May the gods who dwell in heaven and the netherworld constantly praise the temple of Sin, the father, their creator. As for me, Nabonidus king of Babylon, who completed that temple, may Sin, the king of the gods of heaven and the netherworld, joyfully cast his favourable look upon me and every month, in rising and setting, make my ominous signs favourable. May he lengthen my days, extend my years, make my reign firm, conquer my enemies, annihilate those hostile to me, destroy my foes. May Ningal, the mother of the great gods, speak favourably before Sin, her beloved, on my behalf. May Šamaš and Ištar, his shining offspring, recommend me favourably to Sin, the father, their creator. May Nusku, the august vizier, hear my prayer and intercede for me. Nabonidus was passionate about the restoration of the Temple of Sin in Harran, but his devotion came with a price. The restoration was a controversial decision and one that shocked the religious authorities, for a Babylonian king was expected to venerate the supreme god Marduk, not Sin. 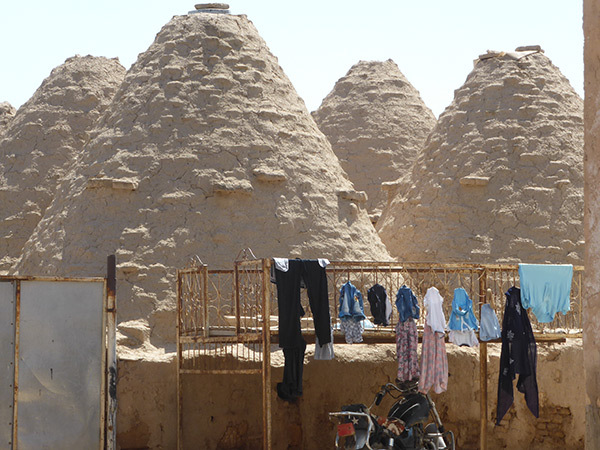 The Babylonian connection is particularly interesting, because this is where another aspect of Harran’s heritage may derive its influence; I speak of the city’s puzzling beehive huts. 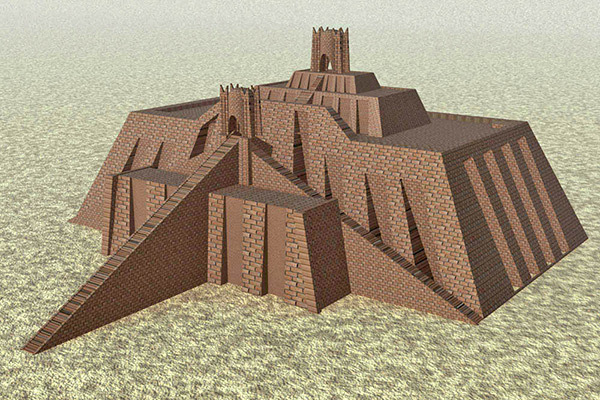 Although convention states that the conical structures were built in stone (by necessity, due to the lack of trees in the region, and also because the unique shape provided a cool dwelling in the summer and a warm residence in the winter), the design is traceable back to Babylonian times, over 5,000 years ago. While the remaining beehive huts of Harran are only a couple of hundred years old, a depiction of a similarly shaped dwelling on the triumphal arch of Septimius Severus, the Roman emperor from AD 193 to AD 211, illustrates a conical residence similar to what we see today. This is portrayed in a scene from a battle against the Parthians, inhabitants of an empire in Iran (247 BCE–AD 224), whose territory included Harran. The implication is that the tradition goes back at least so far. Further, coins from Septimius Severus’s era also portray the lunar crescent, the symbol of Sin. 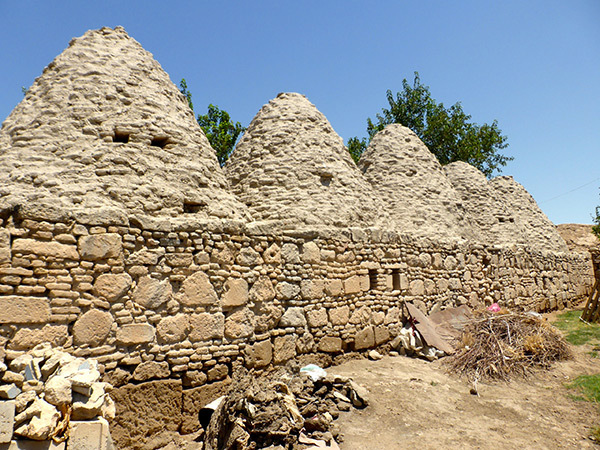 Beehive huts have been found in ancient Saudi Arabia, Ireland, France, Africa and in most regions around the world. Perhaps more importantly, stone reliefs of the Assyrians, who ruled the area from 2500 to 600 BCE, show similar beehive-shaped dwellings and excavations in Mesopotamia show that domed buildings developed at least as early as the seventh century BCE. 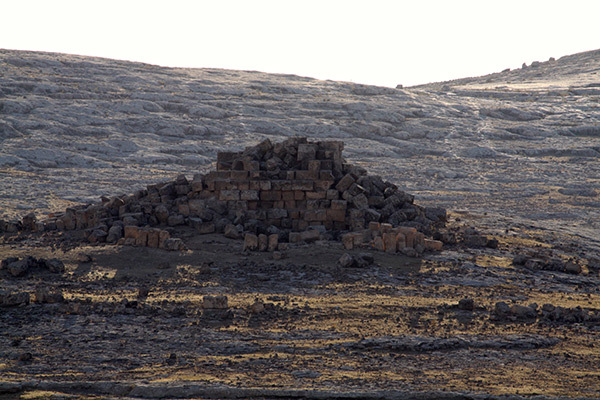 Thus, it is not inconceivable that the unique structures at Harran hark back to the days of its Babylonian occupation, or earlier. Perhaps the best-preserved sanctuaries of the god Sin in northern Mesopotamia are, surprisingly, not in Harran, but a short distance to the east, where some truly sensational ruins confirm the extent of Sin’s former glory. The lunar crescent also resembled a royal crown, and so Sin was known as ‘Lord of the Crowns’. And that is not all. 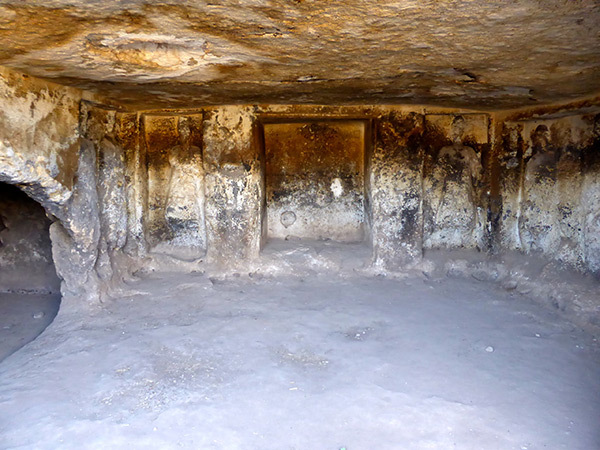 The cave also depicts reliefs of human figures who represent the seven planets symbolised on the hillside outside the cave, in an open-air temple where the sacred planets were worshipped in a series of temple/grotto tombs, one for each of the seven planets. 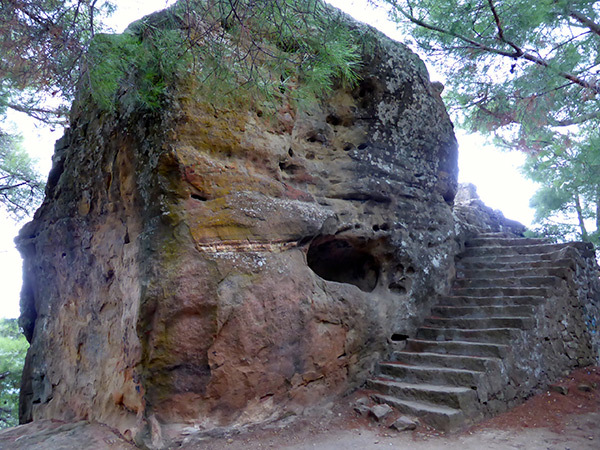 Here, rituals, including human sacrifice, are believed to have been performed. 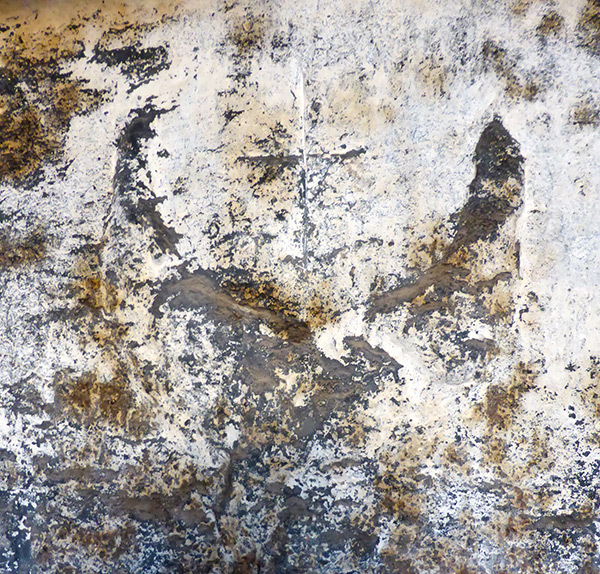 On the hill above the cave is the relief of a man’s head and shoulders with a lunar crescent behind him, and an inscription to his left which includes the reference ‘to Sin’. Curiously, Picatrix, a four-hundred-page book of occult magic and astrology, originally written in Arabic (whose name translates as The Aim of the Sage or The Goal of The Wise), records the Cult of the Seven Planets and may be connected with the Harranians, who venerated planets, as Sogmatar confirms. The site is surrounded by temple/grotto/ritual centres – one for each of the seven planets. Nearby, at the bottom of the hill, is a well that local legend attributes to the famous Well of Moses. 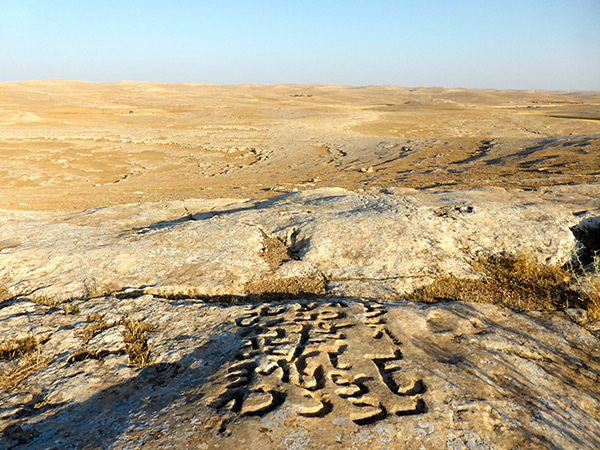 However, the site is not the only one in the area associated with a patriarch, for in nearby Şuayb Moses is said to have lived with his wife and brother-in-law, Jethro. 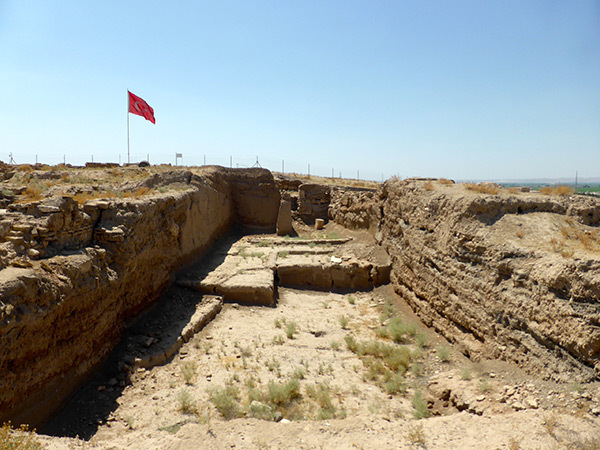 These Mesopotamian sites recall an age of legend and sanctity, although they were about to become usurped by a new centre of worship a short distance from Harran, just to the north, that went by the name of Edessa. 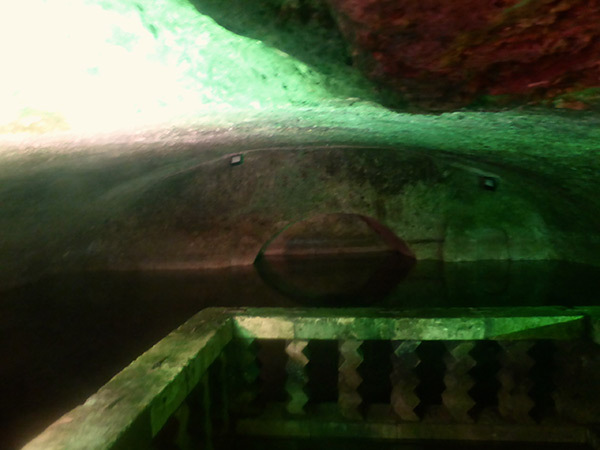 Local legend reports that the biblical patriarch, Abraham, was born to his mother, Sarah, in a cave in Edessa, an ancient and sacred city built by Nimrod, the son of Cush, grandson of Ham and great-grandson of Noah, who later, according to lore, threw Abraham into fire, resulting in the magical transformation of the pyre into the Pool of Sacred Fish (Balıklıgöl). 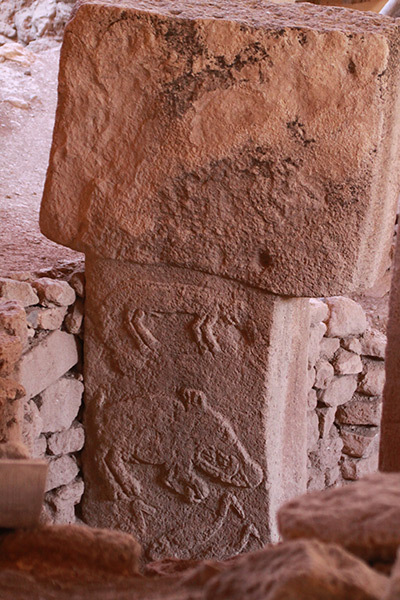 But Edessa’s sanctity extends much further back, as Göbekli Tepe, the world’s oldest temple (just a few miles to the east) attests: it dates to at least 10,000 BCE. Edessa was among the first cities to convert to Christianity and quickly became a school of learning, hosting the famed ‘school of the Persians’ until AD 489. Slowly the Pagan temples began to close, beginning in the first century and accelerating thereafter. But what prompted a city that had just constructed the Temples of Sin in Sumatar Harabesi to turn its back on its god? The answer appears to be related to a letter written by a king to Jesus Christ. The story goes that King Abgar (AD 13–50), a Syriac ruler whose capital was at Edessa, wrote to Jesus Christ, asking him to come to Edessa and cure him of an illness. Jesus politely declined, as he was already in heaven, but promised that one of his disciples would visit in his place. And that, apparently, is exactly what happened. Before long, a disciple by the name of Thaddeus of Edessa arrived, having been dispatched by Thomas the Apostle in AD 29 and, by association with Jesus, promptly cured the king of his illness (most probably leprosy). Curiously, Thaddeus of Edessa was one of the seventy disciples of Christ who were personally sent by Jesus, in pairs, to the far reaches of the region to preach the gospel. Thaddeus of Edessa went by the name of Addai and was a Jew who had been baptised by John the Baptist in the River Jordan before receiving his mission, after the ascension of Jesus, to preach in Mesopotamia, Syria and Persia. But it is in Edessa that he made a name for himself, ordaining priests and converting many to Christianity. While this may seem an unlikely thing in such a Pagan land, Edessa was an established Jewish community and had just elevated the god Sin to the highest monotheistic platitude possible: ‘King of the gods of heaven and earth’ and ‘greatest of the gods and goddesses’. The monotheistic nature of Christianity would have been well received in this theological framework. With respect to the ‘Jesus letter’, it becomes rather convoluted as to how the account was first recorded by the Roman historian, the so-called ‘Father of Church History’, Eusebius of Caesarea. It is said that Eusebius translated the original letter three hundred years after it was written, in the early fourth century, in his Ecclesiastical History, which preceded the later Doctrina Addai, each of which state that the reply of Jesus was given not in writing, but orally, and that the event took place in AD 32. However, biblical scholars such as Robert Eisenman have noted that the Jesus letter (and story) are very widespread in the Syriac sources, with so many multiple developments and divergences that it is hard to believe they could all be based on Eusebius’ poor efforts’ (Eisenman, R., James the Brother of Jesus: The Key to Unlocking the Secrets of early Christianity and the Dead Sea Scrolls (1997). Might the Jesus letter, coupled with the evangelical work of Thaddaeus, have triggered the slow but inevitable adoption of Christianity, by creating a rift from the Pagan traditions and the worship of the god Sin? Between Edessa and Harran raged an active and deep-set hostility that extended through the sphere of politics and economics and of religion. The regional rivalry, and the way it manifested itself between groups of people living in close proximity (but separated by ideological pride), would not have been much different to that felt by sports fans in modern times whose loyalty is divided between a city’s two competing teams. In England this is perhaps best exemplified by the rivalry between the Liverpudlian soccer clubs, Liverpool and Everton, and in London between Chelsea and Arsenal. Each ‘fan base’ loathes the other. Forget, for a moment, that today’s sports arenas are the cathedrals of our time and the place where more intention, and prayer, take place than in any other stratum of our society; the point being… well, you get my drift. Supporters of the cult of Christianity in Edessa would have felt threatened by the stubborn solidarity of Harran, and this very conscious paranoia may have become the impetus for the war against the Gnostics, as kick-started by Irenaeus and his wayward guilt-ridden notion of original sin. There were other factors conspiring against Harran. The fact that it was located on a low-lying plain and the nearest source of water, apart from a few humble wells, was a river over ten miles away, contributed to the fact that it could never really defend itself. Nevertheless, things such as a state religion never turn like a switch, and some allegiances were kept private, such as King Agbar’s practice of worshipping the seven planets in the privacy of the great altar in his palace, which suggests that his ‘conversion’ had more to do with matters of state than spirituality. But still, the illusion became the reality and the rest, as they say, is history. 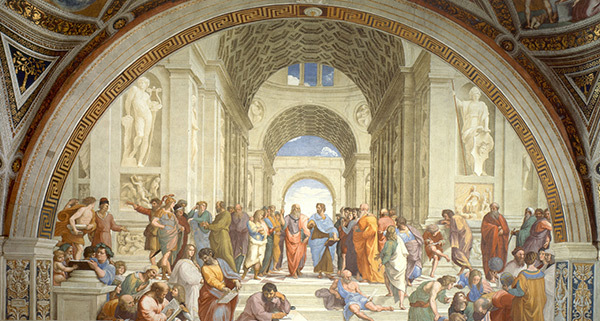 In 529 the Byzantine emperor, Justinian, closed the Platonic Academy, Plato’s academy of higher learning outside Athens, due to his belief that it was a Pagan institution bent on perpetuating Pagan traditions. The members of the Academy, along with their precious scrolls of multi-disciplinary knowledge, were swiftly taken to Persia. Three years later, in 532, a religious peace treaty between the Persian and the Byzantine Empire allowed the outcast Pagans to leave and, with the world as their oyster, most fled to Harran, an indication that the once-Pagan stronghold was still highly regarded by those in the know. However, this was a fleeting reprieve for Harran. Edessa had won the hearts and minds of the region and would forever be remembered for its biblical patriarchs and not the king of kings, the moon-god who had captivated its imagination for thousands of years previously. Over my birthday, in August 2014, I delivered my ‘Hidden Hive of History’ lecture to a group of Rudolph Steiner enthusiasts, and beekeepers, in Konstanz, Germany. Upon my arrival the event organiser relayed a most intriguing story, suggesting that the ancient god Sin had incarnated, in recent years, in Germany. She shared how the god Sin, who had been living on the Black Sun, had informed a respected teacher in the Steiner School that he was to relinquish his body and remove his soul from his earthly confines. Over the course of a couple of years the Steiner School instructor and his trusted colleagues prepared for the soul swap. I met with a gentlemen, a very intelligent and successful businessman who was present on the day of the alleged event, and who recounted what had happened. He shared that the Steiner School instructor had sat in a chair, surrounded by his colleagues, who had facilitated the soul-swap ritual. When the moment came the Steiner School instructor fell to the floor. Just for an instant he appeared dead, and then, suddenly, his body came to life. 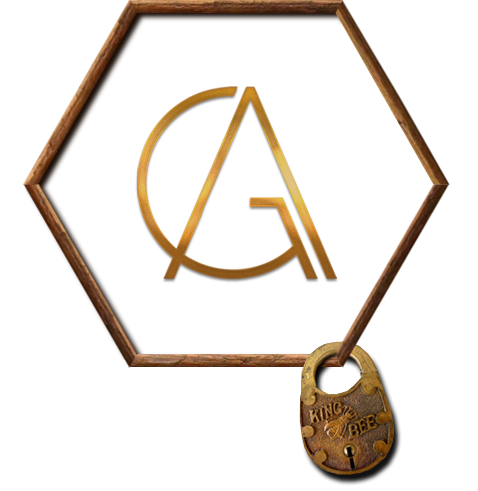 This new individual, allegedly the god Sin, brought new skills to the old body, but also failed to maintain many of those that the Steiner School instructor had developed over the years, such as the ability to drive a car. 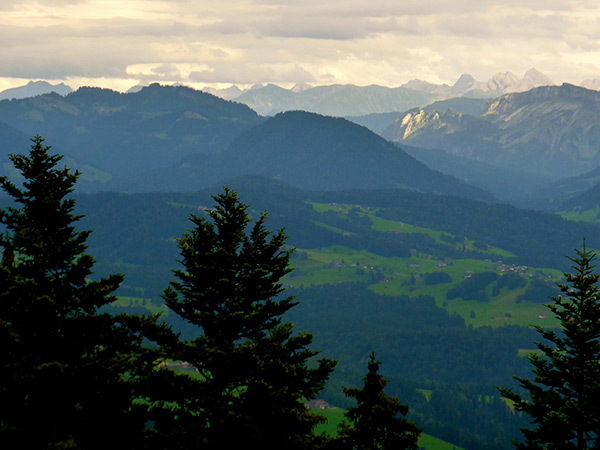 The Steiner School instructor, now transformed into the god Sin, has procreated and, although advancing in age, continues to conduct retreats in the region. Regardless whether the story is true or fantasy, it remains testament to the fact that the original god Sin is still alive in our thoughts and hearts today, if only beneath the surface. Original sin, indeed.